You may visit McDonald's at 11 Delamere Street, approximately a 0.21 mile driving distance south of the centre of Crewe (by Crewe Bus Station). This restaurant principally serves the patrons in the districts of Beechmere, Crewe Green, Crewe Town Centre, Shavington, Wistaston, Coppenhall Moss and Coppenhall. Today’s open hours (Friday) are from 6:00 am to 11:00 pm. Here you can see the hours of business, restaurant address details and customer experience for McDonald's Crewe, Delamere Street. McDonald's is situated in an ideal place close to the crossroads of Market Square, Delamere Street and Queensway, in Crewe, Cheshire. Only a 1 minute drive from Prince Albert Street, Chester Street, Earle Street or Market Street; a 5 minute drive from Edleston Road, Dunwoody Way and Vernon Way; and a 12 minute trip from Crewe Green Road and Crewe Road. To get to this location easily, key in the following navigation coordinates: CW1 2HR. The nearest bus stops are Earle Street, Christadelphian Hall, High Street and Crewe Bus Station. Customers can reach the restaurant by the train at Crewe Station (3980 ft away). Available via the Virgin Trains line. Within a couple miles you can visit Sir William Stanier Community School, Hungerford Primary Academy, Cumberland Sports Arena, Crewe Cemetery, Crewe Library and Oxley's Funeral Services. There is currently a total number of 4 McDonald's locations open in Crewe, Cheshire. 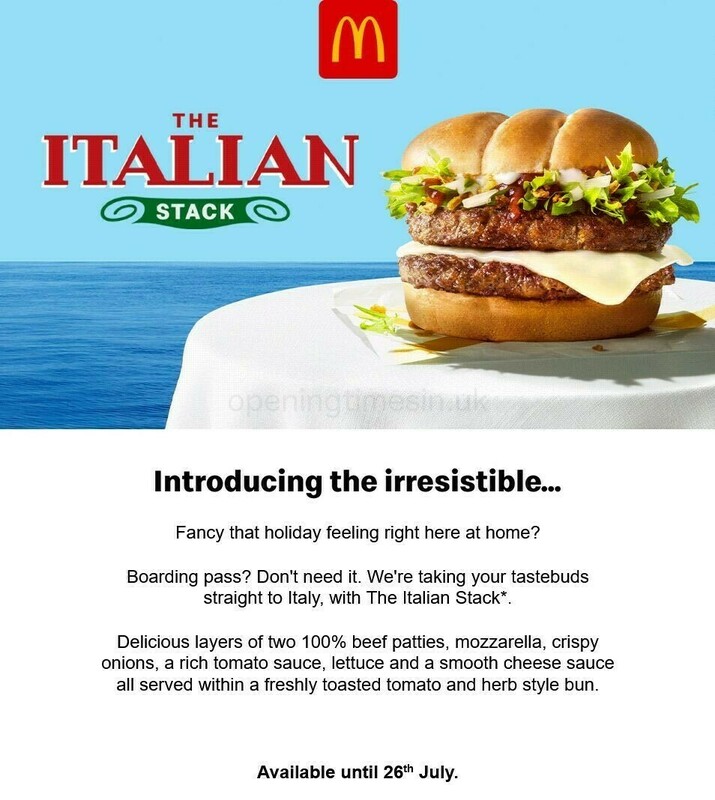 For more McDonald's visit this following page for an entire index of all restaurants near Crewe. McDonald's in Crewe, Delamere Street may revise hours of operation during UK national holidays. In 2019 these updates include Xmas Day, New Year's, Easter Sunday or Black Friday. It is recommended that you go to the official website or phone the direct information line at 370 524 4622 to get further info about McDonald's Crewe, Delamere Street seasonal business hours. It's the Opening Times in the UK team's intention to supply you with the most accurate information as possible. If you found any discrepancies or mistakes in the place of business address or working times for McDonald's in Crewe, Delamere Street, please use this form to report a problem. You are invited to express your critique of McDonald's, and rate its location using the star ranking system.